In Greece and elsewhere, austerity is nothing more than capitalists imposing their class interests. In reality, economic crises express themselves not only in a lack of effective demand, but above all in a reduction of profitability of the capitalist class. Austerity constitutes a strategy for raising capital’s profit rate. Austerity is the cornerstone of neoliberal policies. On the surface, it works as a strategy of reducing entrepreneurial cost. Austerity reduces labor costs of the private sector, increases profit per (labor) unit cost, and thus boosts the profit rate. It is complemented by economizing in the use of “material capital” (alas, another demand curtailing strategy); and also by institutional changes that, on the one hand, enhance capital mobility and competition and, on the other, strengthen the power of managers in the enterprise and shareholders and bondholders in society. As regards fiscal consolidation, austerity gives priority to budget cuts over public revenue, reducing taxes on capital and high incomes, and downsizing the welfare state. However, what is cost for the capitalist class is the living standard of the working majority of society. This applies also to the welfare state, whose services can be perceived as a form of social wage. It is clear, therefore, that austerity is primarily a class policy. It constantly promotes the interests of capital against those of the workers, professionals, pensioners, unemployed, and economically vulnerable groups. In the long run, it aims at creating a model of labor with fewer rights and less social protection, with low and flexible wages, and no substantial bargaining power for wage earners. Austerity does lead, of course, to recession. However, recession puts pressure on every individual entrepreneur, both capitalists or middle bourgeoisie, to reduce all forms of costs, to more intensively follow the path of relative surplus value, i.e. to try to consolidate her profit margins through wage cuts, intensification of the labor process, infringement of labor regulations and workers’ rights, massive redundancies, etc. From the perspective of big capital’s interests, recession thus gives birth to a process of creative destruction. There is a redistribution of income and power to the benefit of capital, and concentration of wealth in fewer hands as small and medium enterprises, especially in retail trade, are being cleared up by big enterprises and shopping malls. This strategy has its own rationality that is not completely obvious at first glance. It perceives the crisis as an opportunity for a historic shift in the correlations of forces to the benefit of the capitalist power, subjecting European societies to the conditions of the unfettered functioning of financial markets, attempting to place all consequences of the systemic capitalist crisis on the shoulders of working people. This is the reason why, in a situation of such an intensification of social antagonisms like today, a government that wants to side with labor and the social majority cannot even imagine succumbing to pressures to continue implementing austerity policies. Neoliberalism is a form of capitalist govermentality, i.e. of organizing the power of capital over the working classes and the social majority. It is based on the one hand on austerity, as already argued, and on the other on the crucial regulatory role of the globalized financial markets. The financial sphere is not simply the reign of speculation, is not a casino — it is much more an overseeing mechanism. In his analysis in Volume III of Capital, Marx illustrates that social capital is being occupied by two “subjects”: a “money capitalist: and a “functioning capitalist.” In the course of a lending process, the money capitalist becomes the recipient and proprietor of a security, that is to say a written promise of payment from the functioning capitalist, the manager. In Marx’s own words: “In the production process, the functioning capitalist represents capital against the wage-labourers as the property of others, and the money capitalist participates in the exploitation of labour as represented by the functioning capitalist.” Secondary contradictions between the managers and the big financial investors certainly do exist, but they are minor in comparison to the capital-labor class contradiction. Every enterprise is Janus-faced — comprising, on the one hand, the production apparatus per se and, on the other, its financial existence, its shares and bonds, which are being traded on the global financial markets. The production of surplus value constitutes a battlefield situation where resistance is being encountered, meaning that the final outcome can never be taken for granted. Techniques of risk management, organized within the very mode of functioning of the deregulated money market, are a critical point in the management of resistance from labor, and thus for promoting and stabilizing austerity. Financial markets generate a structure for overseeing the effectiveness of individual capitals, that is to say a type of supervision of capital movement. The demand for high financial value puts pressure on individual capitals (enterprises) for more intensive and more effective exploitation of labor, for greater profitability. This pressure is transmitted through a variety of different channels. To give one example, when a big company is dependent on financial markets for its funding, every suspicion of inadequate valorization increases the cost of funding, reduces the capability that funding will be available and depresses share and bond prices. Confronted with such a climate, the forces of labor within the politicized environment of the enterprise face the dilemma of deciding whether to accept the employers’ unfavorable terms, implying loss of their own bargaining position, or face the possibility of losing their job: accept the “laws of capital” or live with insecurity and unemployment. This pressure affects the whole organization of the production process. It therefore presupposes not only increasing despotism of managers over workers but also flexibility in the labor market and high unemployment. Hence, market discipline must be conceived as synonymous with capital discipline. The theoretical sketching that I tried to present above apprehends the phenomenon of capitalist globalization and financialization as a complex technology of power, the main aspect of which is the organization of capitalist power relations. It is a technology of power formed by different institutions, procedures, analyses and reflections, calculations, tactics, and embedding patterns that allow for the exercise of this specific, albeit very complex, function that organizes the efficiency of capitalist power relations through the workings of financial markets. The working majority in practically every capitalist country will always be opposed to shrinking of wages and precarious employment, degeneration and cutback of public services, raising the cost of education and health care, weakening of democratic institutions, strengthening of repression. They will always conceive the “crisis of labor” (i.e. unemployment, precarious, and underpaid work, etc.) as a social illness that shall be tackled by itself, not as a side effect of the recovery of profits. The capitalist maintains his rights as a purchaser when he tries to make the working-day as long as possible . . . On the other hand . . . the labourer maintains his right as seller when he wishes to reduce the working-day to one of definite normal duration. There is here therefore an antinomy, of right against right, both equally bearing the seal of the law of exchange. Between equal rights force decides. In the eurozone, political risk is supposedly being minimized through the introduction of an institutional framework in which austerity is the only way to deal with economic and financial instability. In the usual nation-state setting, a single national fiscal authority stands behind a single national central bank. As we know, this is not the case with the eurozone: there is no solid and uniform fiscal authority behind the European Central Bank (ECB). Member states issue debt in a currency which they do not control in terms of central banking (they are not able to “print” euros or any other type of currency, at least not for a considerably long period of time). Member states will not always have the necessary liquidity to pay off bondholders. This will make the downsizing of the welfare state a precondition for financial solvency. The ruling European elites have thus voluntarily subjected themselves to a high degree of sovereign default risk in order to consolidate the neoliberal strategies. In other words, they have jointly decided to exploit the crisis as a means to further neoliberalize state governance. Member states are faced with a dilemma: austerity, cuts, and privatizations or risk default. By and large, these are commensurate choices. Even in the latter scenario, member states would accept a rescue package, the content of which is again austerity-cuts-privatizations. This conservative perspective recognizes as a “moral hazard” any policy that supports the interests of the working class, expands the public space, supports the welfare state, and organizes the reproduction of society beyond and outside the scope of markets. In this framework, the strategic question for EU neoliberalism is to define the level of austerity that targets an optimal balance between political risk and moral hazard. Generally speaking, these two risks, the “moral” and the “political” one, move in opposite directions due to their consequences in the political conjuncture. When moral hazard increases, political risk declines and vice-versa. Therefore, the tension (when they encounter each other) results in an appropriate balance between them. The “independent authorities,” being immunized against any democratic control, especially on issues related to the economy (the main example here is the ECB), create a mechanism for detecting the balance between these two “risks.” Nevertheless, this mechanism will always remain incomplete. Class struggle will always create contingent events. After five years of extreme austerity policies in Greece and the reshuffling of the political system as we used to know it (mainly through the break up of the Socialist Party, Pasok, which has been in power for more than twenty years over the last three decades), the national elections on January 25, 2015 led to the victory of the Left. Syriza, having gained 149 out of the 300 seats in the Greek Parliament, formed a coalition government with ANEL (Independent Greeks), a small anti-austerity party stemming from the conservative political camp. The mandate given to the government by the electorate is twofold: (a) stop austerity policies; and (b) secure a deal with the official lenders of the country (the EU, ECB and International Monetary Fund, which were called the troika and are now referred to as the institutions) in order to cover the financing needs of the Greek public sector. The “financial gap” of the Greek public sector mainly refers to liabilities to the institutions in the framework of the bailout programs of the previous years. On February 20, 2015 the Greek government reached an intermediate agreement with the lenders, which includes a four-month extension of the existing “Master Financial Assistance Facility Agreement” (MFFA), signed by the previous government, which is “underpinned by a set of commitments.” At the end of this transitional period a new agreement between Greece and the institutions will be signed, which according to the program of the government would include a new fiscal framework for the next three to four years and a new national plan for reforms. The February 20 agreement was a truce — but truce is by no means a tie. 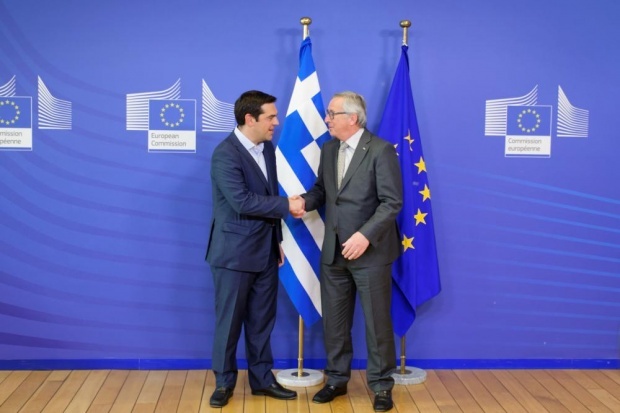 Given the fact that the institutions adjudicate on whether Greece’s commitments have been reached or not, this agreement has proven to be a step on slippery ground. As every decision still requires approval by the institutions, even scheduled installments as they appear in the previous program, are still pending, subject to a positive evaluation by the institutions. The agreement is not entirely closed to demands that increase moral hazard, i.e. to promoting arrangements to the benefit of the welfare state and labor interests. However, the key point of the agreement is that the institutions will assess, supervise and indicate which particular reforms do not create problems to public finances and do not jeopardize future economic growth and the stability and smooth functioning of the financial system. This assessment-surveillance is a serious impediment to the implementation of the political program and the social transformations sought by Syriza in the first place. While the question of how the government will be able to meet its financing needs remains open, statements by the ECB and the IMF are eloquent proofs of the continuous assessment that new pledged reforms are interpreted as substitutes for the commitments of the previous agreement. Storming forward with the government clearly bringing to the fore of the agenda Syriza’s programmatic commitments to redistribute income and power in favor of labor, to re-found the welfare state, democracy, and participation in decision making. Storming forward with the government launching a radical reform of the tax system (so that capital and the wealthy strata of the society finally bear their appropriate burden), and with the fight against corruption of part of the Greek economic elite. A new wave of radical domestic institutional changes is urgently needed in order to build on a new basis the social alliances with the subordinate classes. What is missing is a domestic “memorandum against the wealthy” which will improve the living conditions of the working people. The oft-stated goal of the left that “capital should pay for the crisis” has never been more to the point. This internal dynamic will strengthen the effectiveness of negotiations with lenders. The issue is political. The neoliberal trap can be broken if the Greek government makes it clear that if forced, and in order not to breach the mandate given to it by the electorate, it will dare to delay reimbursement payments, until an agreement with the institutions has been reached. In order to be successful in this internal dynamic, the Greek government must stick with the class prejudices of Syriza’s program: the protection of the interests of social majority against those of capitalist oligarchy. This necessary partisanship is often characterizes the speeches and declarations of the prime minister, Alexis Tsipras. But this does not always appear to be the agenda of the Greek finance minister, Yanis Varoufakis. Soon after the election, he suggested publicly that 70 percent of the memorandum is good for Greece. The Syriza government did not come to power supporting 70 percent of the memorandum. If Syriza had pledged so, it would probably not be included in the parliamentary map today, playing the key role. Such notions redefine the Syriza mandate and amount practically to an attempt to change the social alliances which have supported so far the historical experiment of a left government in Greece. In the year 2015, after five years of catastrophic recession, where ultimately everybody is a victim, there are only a few cunning people who have profited from this crisis. The era in which a government of the Left was by definition contrary to the milieu of entrepreneurship has passed. If we get to a point when there is growth, we can start talking again about conflicting labour and capital interests. Today we are together. Furthermore, it is characteristic that in the memorandum, economic growth relies on exports and every wage increase is automatically considered as being against competitiveness. No matter how empirically erroneous is this perspective, it still reflects the viewpoint of the institutions and, unfortunately, still of the Greek Ministry of Finance. The mainstream approaches that we have presented, do not reflect the positions of the finance minister alone. A considerable part of Syriza’s cadres comprehend austerity and the memoranda as simply “an economic mistake,” merely in the sense that it constitutes a recipe for recession that is unable to boost growth. In a society where the loss of 25 percent of GDP and the impoverishment of a large part of the population is just the visible aspect of the rapid intensification of social inequalities, in a society where mass unemployment is the numerical complement of a severe deterioration in working conditions, in a society of multiple contradictions and expectations, the policy of the Syriza government can only become hegemonic if it clearly supports the interests of the working majority in their struggle against capital. There is no room for a policy generally and loosely defending everything “Greek” or “European.” Such an approach never has, and never will represent the perspective of the Left. We face a historic challenge, and we must respond without hesitations and vacillation. John Milios is a professor of political economy at the National Technical University of Athens and a member of the central committee of Syriza.